HE IS DOIN’ IT, TO IT! 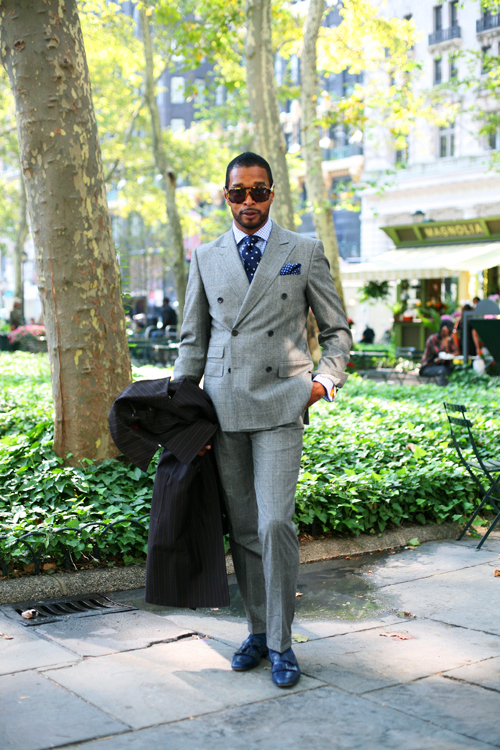 Great mix of patterns, and a well tailored Double Breasted suit…Well done. I am really considering buying a double breasted suit, after seeing how good they can look when they fit correctly. Years of seeing uncles in horribly fitted db’s at weddings scarred me. However, Sart has shown me otherwise! Love how he brings some classic uptown style to what seems to be a kinda classic suit. WHAT MORE IS THERE TO SAY….MANHATTAN TO THE MAX!! I love it! so over the top! Good looking guy. Nice suit, even if it’s a bit too matchy-matchy for my taste. Nicely put together, but the fit seems a bit awkward. It looks like this magnificent man doesn’t have quite enough room to breathe. Flawless outfit! I love everything about it, especially the daring blue shoes. I badly want his tie and pocket square. oouh maaannnn… I like the shoes!! matchy matchy can work on women, but for some reason it doesn’t seem to work the same on men. The outfit and the pic are beyond, any doubt, superlative! That is one sharp Cat! Why no comments? Is the sheer perfection of this ensemble too intimidating? The blue shoes lift the effect from elegant to exhilarating. The grey & the blue, fantastic. All left to day is WELL DONE SIR! usually such over color coordination looks pretentious, but this guy really pulls it off with élan…..
Are the shoes the correct style for this suit? They seem too casual/sporty to me. Any other ideas? The guy is doing well, even if the jacket spans at the button, until…we…get…to the shoes. By the way, don’t we want to comment on T. Brown’s codpiece fashions? I’d say, we do…. Great fit, those details on the jacket are everything I’m looking for. Blue Shoes, this man is my hero! I love it With the Pocket Square! Thanks for this picture! This outfit destroys. Here’s to men looking like men and not over-stimulated toddlers. To me, this look is still fun, while staying masculine and sharp. A double-breasted suit that fits this well must have cost a pretty penny though. i love how he’s bringing back the classic double breasted suit. much better than the regular suit most men are sporting around with now. Great tailoring and nice shirt. The working sleeve buttons do not go unnoticed. The shoes? Well, not my taste, but he seems to pull it off fine. Hello! You’ve got my attention…no doubt about it! I love it all. I love polka dots and respect any man who’ll wear them. I love double breasted suits and respect their wearers, too. But the shoes… Why those shoes? Why, I ask, why?! 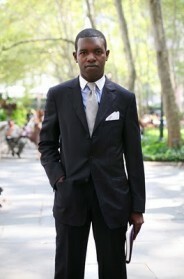 Probably the best dressed gentleman on this blog since Matteo Marzotto. Everything works – picture perfect. Well done Monsieur !!! THE “BLACK GATSBY” INDEED! F. SCOTT WOULD INDEED BE PROUD OF THIS SATORIAL ELEGANCE….AN ULTRA ELAN TAKE ON THE LOOKS OF YESTER-YEARS!! more mix of patterns and colors can be better style. but i understand him, his idea was all around the blue shoes. Straight from old Hollywood (aka the new Tom Ford store). Love the mix of colours and styles!! and his shoes… fantastic!! had to do a double take. @ the suited mister with blue kicks. Sharp. I dig the blue kicks! looks good, but the shoes are really bad. Does it get any better?! He looks extremely well tailored but those shoes are amazing! I think he looks great but I have to concur with the poster who said the outfit was a little too matchy. The whole effect almost feels costumey to me. He pulls it off, however, with his bravado. oh absolutely superb. i’m speechless. easily the bet male outfit (& attitude) so far. I love the gray against the vibrant blue. Damn, he looks good. Now that’s gangsta’! He’s tried very hard, and he looks good. Unfortunately by trying so hard he doesn’t look great. This is the look sept 15th’s guy should aim for: it pops, it is gorgeous and in no way over the top. How could you not LOVE the personality in this outfit!? Very well done! Someone please explain the bright color shoe that matches pocket square. Outfit look s great until the pumps. I love this picture. The one thing I dislike is the attention he has drawn to the working cuff of this blazer. He has made it so obvious that he wanted the cuff to be noticed so much so that it no longer looks subtle – it looks a bit too thought out now. I’m not sure if anyone else spotted that but the magic is in the details. But then again this gent wanted to be noticed – hence the turn ups in the trousers also. I do like the shoes, but it would have been nice to see what colour socks were worn…I suspect navy!